A critical step in a successful industrial flooring installation is the expert preparation of the substrate surface for the application of the flooring system. The long life of your new floor depends on it. By preparing the surface with the right amount of profile or tooth, we can ensure a proper bond of the coatings to the substrate, extending your floor’s strength, durability and beauty. 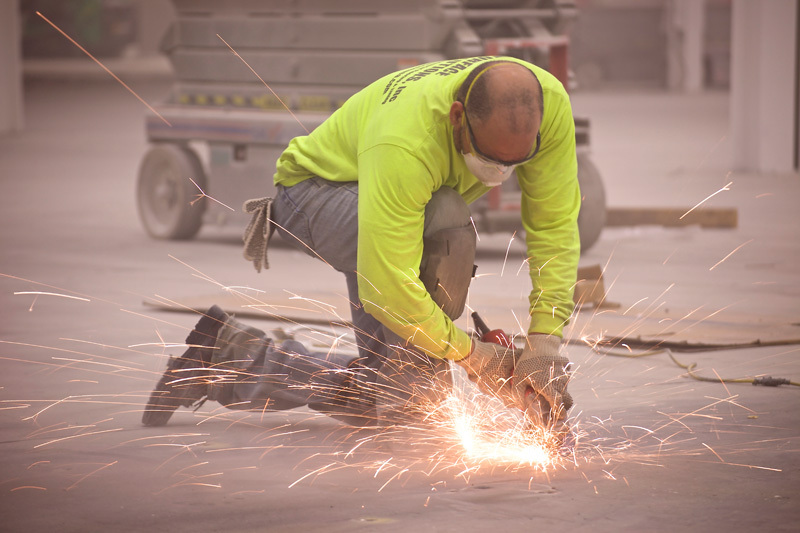 Cutting – Specialized saws for cutting masonry and other materials are used for decorative concrete cuts including arcs, cleanout for tuckpointing, routing out cracks and joints and other applications. Shot Blasting – Shot blasting is a cost-effective, labor and time-saving method for preparing concrete and steel surfaces. This process strips, cleans and profiles simultaneously, leaving the surface ready for the bonding process without additional drying time and costly disposal. Different surface profiles are achieved by varying shot size, shot flow rate and machine travel speed. Grinding & Polishing – Planetary grinders, diamond grinders and polishers are used to quickly cut through heavy, built-up adhesives, elastomeric coatings and waterproof membranes, remove surface imperfections, coatings or residues, mastics, epoxies, urethane or paint, smooth or flatten concrete slabs and prep concrete for decorative applications. Especially useful when applying thin coatings, grinding machines also polish concrete to a high shine and restore old slabs for architectural finishes such as staining or densifying. Scarifying – Used for concrete, asphalt and steel surfaces, scarifiers use steel or carbide tipped cutters to fracture an existing coating or abrade the surface, removing oil, contaminants, traffic lines or paint. Scraping & Stripping – Ride-on scraping machines remove tile, mortar and grout beds, tough mastics, adhered membranes and floor coverings. Different scraping teeth remove everything from carpet to tile, wood to VCT and more. Dust Collection – Dust collectors and vacuums are designed for surface preparation projects and reduce airborne dust and particulate for a cleaner, safer work environment. Blastrac®, a global leader in portable surface preparation technologies and equipment including shot blasting machines (centrifugal wheelblast) and dust collectors, that are environmentally friendly, economical solutions. View our brand new Showcase Picture Gallery featuring recently completed quality flooring installations by Surface Solutions.